What is commercial roof repair? That’s a great question with an answer that could literally fill a book. In order to attempt to provide an efficient answer, we’ll narrow the scope of the question to commercial flat roof repair. While there are many different styles of commercial roof, flat roofs dominate the landscape – at least in North America. Even still, commercial flat roofs can be constructed with a variety of materials and methods, which we will introduce briefly. 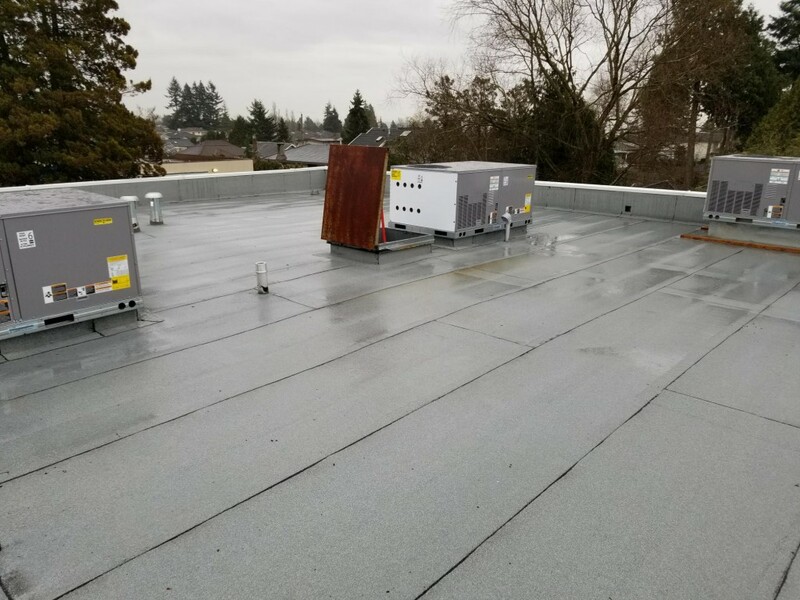 Either way, it is useful to know that flat commercial roof repair represents unique problems because of the nature of these roofs – the low pitch means these roofs are prone to damage from collecting water and the subsequent erosion of roofing structures. But, since flat roofs are inexpensive and easy to access and repair, they are popular. So, let’s take a closer look at flat commercial roof repair. Flat commercial roofs usually feature a waterproof membrane that is constructed from a range of materials including elastomeric, rubber, metal, and even PVC materials. Each of these materials offers distinct benefits. For example, elastomeric roofs feature an elastic coating that is energy efficient and resistant to damage from the sun. Rubber roofs are usually reflective and cost less while providing a long lifespan. Metal roofs tend to be expensive, but they look great and lower your energy costs. Finally PVC roofs are durable and resistant to harsh weather such as wind and even fire. Nevertheless, commercial roofs still require regular maintenance and repair. No matter how well constructed, or how durable the material, roofs will break down over time. A regular maintenance schedule helps to identify roofing problems early so that major leaks or damage can be avoided. Some of the features that require special attention are structures such as vents or fans that roofing materials are installed around. Leaks are common in these areas, especially when seals around these fixtures start to breakdown. Another consideration is the fact that flat roofs tend to pool water. Again, pooling water is a threat to the materials used in commercial roofs, and regular inspection helps to ensure that your roof is kept in good condition which ultimately will extend its lifespan. Indeed, the proactive approach to commercial roof repair is always the best approach. There is extensive evidence that the cost of prevention is significantly less than the cost of reactive maintenance – that is preventing a leak before it becomes a major problem is much less expensive than repairing once you’ve identified a leak has started to damage internal structures of your building. Perhaps the most important take home message about commercial roof repair is that there are a wide variety of styles and materials involved in commercial roofing, but that regular maintenance and inspection schedules help to extend the lifespan of your roof and reduce your repair and replacement costs.